Cost: The menu is small but well thought-out, themed around small eats, and grouped into snacks, land, sea and soil. 'Land' dishes (meat and poultry) cost from £7 to £29, 'Sea' (fish and seafood) from £5 to £10. The 'soil' small eats are vegetable-based, with squash, plaintain, asparagus and quinoa featuring prominently, and priced from £7 to £8. All the fish and seafood is sourced from the British coast, and the meat is all from Yorkshire. Piscos and cocktails are priced at £8.50. Entry-level wines start at £23 for a Spanish Macabeo or an Australian Shiraz. About: Pachamama, meaning 'Mother Earth' in Quechua language, is one of a cluster of Peruvian restaurants to open in London in the last couple of years, situated in Marylebone, just a stone's throw from The Wallace Collection. With a discrete ground floor door that is very easy to miss, the restaurant opens up in the basement to a surprisingly cavernous space, with a 10 -seater bar for cocktails and small eats, and around 70 covers. Fairly packed on the midweek evening we attended, the restaurant is all distressed wood-panelling, tiled floors, and plain wooden tables. The menu is Peruvian themed, with some Japanese-influenced Nikkei dishes, a small wine menu, and cocktails on a Peruvian Pisco theme. The young head-chef Adam Rawson, formerly of White Rabbits in Dalston, has ambitious plans for the restaurant, having hired a Peruvian sous-chef in February 2015. What We Ate: From the snack options, we had salt and aji squid (£4.50) and chicharones (deep fried pork belly) with sweet onions (£4.50). The squid was tender and well flavoured, served with a powerful aji mayonaise. The chicharones were superb, with tender, flavoursome pork in a crisp shell. From the 'Sea' menu, we had the Cornish seabass with pumpkin, samphire, red onion, radish, coriander and leche de tigre (tiger's milk) (£9). The tiger's milk was golden from aji amarillo, with a nice amount of chilli heat and not too much acidity or sweetness, which are often problematic features of leche de tigre outside of Peru. The yellowfin tuna with soy and pickled potato ceviche (£9), was also excellent. Flavoured with hot rocoto chilli in the soy, wasabe and olive oil dressing, this had some good Peruvian Nikkei flavour combinations. Next came the Cornish crab served with purple potato and green herbs (£10) in a richly infused saffron-dashi which was creamy and delicious, akin to a crab-bisque. Scallops conchita (£5), was served in the shell, with beautifully seasoned quinoa and a zingy tomato and red onion salsa, this was a very refreshing dish. 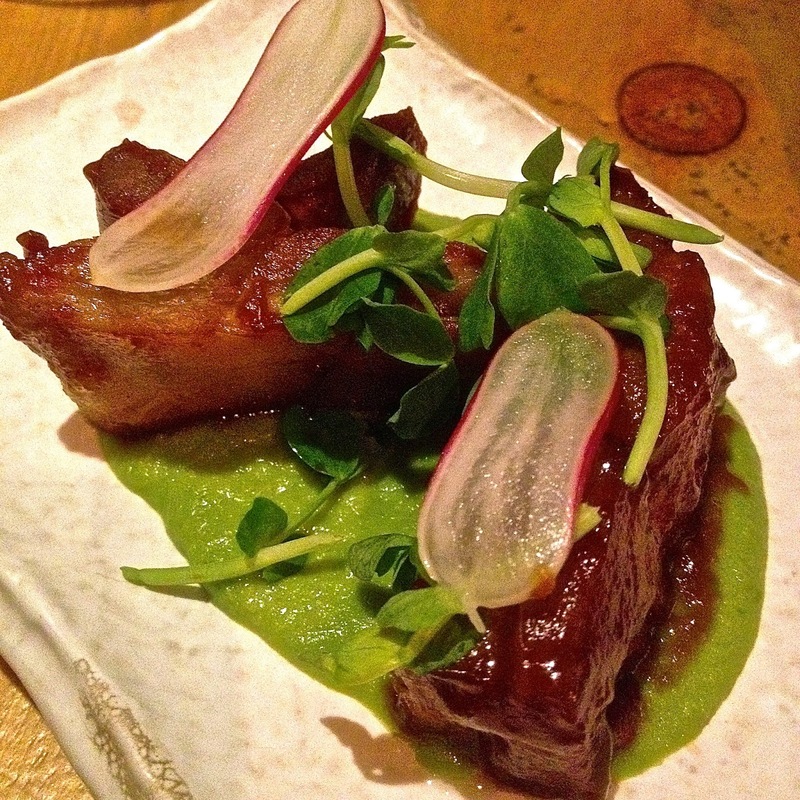 From the 'Land' menu, we had the crispy lamb belly with green miso (£9). Lamb belly can be very fatty, and is great for braising then deep frying. The meat was succulent but crispy with the spicy green miso made from white miso, green jalapeno chillies, garlic and lime helping to cut through the fattiness. We also had the beef cheek Lomo Saltado (£14). Lomo saltado is a Chinese-Peruvian dish, cooked by the 'Chifa' Chinese migrant labourers when they came to Peru in the early 20th century, and today is one of Peru’s national dishes. Pachamama's version featured some unusual ingredients like beef cheeks and parsnips not commonly seen in this dish. It had little resemblance to the dish we tried in Peru, and lacked the vibrancy of the other dishes we had on our visit. From the 'Soil' menu, we tried the Peruvian asparagus with saffron yolk and peanut (£8). Although I could not taste much saffron, there was quite a kick of chilli heat, and the asparagus was well cooked with a delicious smoky flavour. Better still was the fried aubergine with smoked yoghurt and pecan (£8) – with unctuously tender flesh within a crispy deep-fried exterior, the aubergine was delicious accompanied by the smoky, nutty yoghurt. 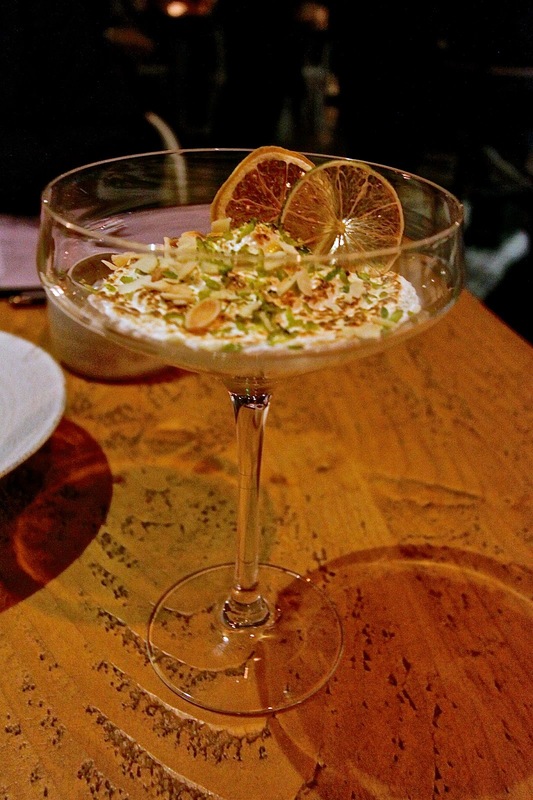 We shared a couple of desserts - the suspiro de Limena (£6.50), served in a Champagne goblet, had a sweet lemony meringue, and a creamy base flavoured with tart passion fruit – great contrasting flavours and textures. The torta de chocolate with toasted quinoa ice cream was also good, with a malted, nutty flavour to the ice cream, although the torta had the texture and flavour more akin to a mousse than a cake (£6.50). What We Drank: We kicked off with a couple of cocktails - the Shining Path was a refreshing Champagne based drink, spiked with cinnamon and Abbott’s bitters. The Rosa del Inca was one of Pachamama’s many Pisco cocktails - infused with pink peppercorns and Volcano coffee beans, vermouth, Campari, orange bitters, this was delicious, with a bracing combination of bitter flavours and subtle coffee notes. With our fish dishes, we had the house white, Matos Blanco from Spain (£7.50 for 250ml), which was non-descript, and completely outclassed by the food. Similarly, with the meat course, we had the house red, Matos Tinto Tempranillo from Spain (also £7.50 for 250ml) - again fruity but undistinguished, and a very poor partner for the food offered. Pachamama has a reputation for its cocktails, so as a digestif, we had a couple more (£8.50 each). The Dulce de Chasca featured dulce de leche, rum, Pisco, vanilla syrup and chocolate bitters, and was an appropriately fruity yet potent end to the meal. The Pichu Pichu had Volcano Peruvian coffee, Pisco, Kahlua, chocolate and vanilla bitters - a generous hit of potent coffee and chocolate flavours to complete an excellent dinner. Likes: Particularly outstanding were the chicharones, the Nikkei yellowtail tuna, the scallops conchita, the fried aubergine and lamb belly. The cocktails were strong and well made. Dislikes: The music is loud to the point of being almost night-club level, and if you lean against the walls, they shake. Although we really liked almost all the dishes, they were uniformly quite spicy, and this does not reflect our experience of food in Peru, where there was a variety of spicy, citrus and savoury dishes. The lomo saltado was the weakest link of our evening, tasting like an English beef stew - nothing wrong with that but not what we were looking for in a Peruvian restaurant serving one of its great national dishes. Verdict: There is some seriously good cooking at Pachamama. With a good Marylebone location and a well-priced menu, this is definitely a place to check out. Highly recommended. Panchamama. I've got a little gift from the Earth mother herself, from Cusco. There is so much going for Peruvian food on the international scene these days. But the best Ceviche and papa a la huacaina and canchitas and pollo a la brasa. That all is still Peruvian to me. Great concept restaurant though!